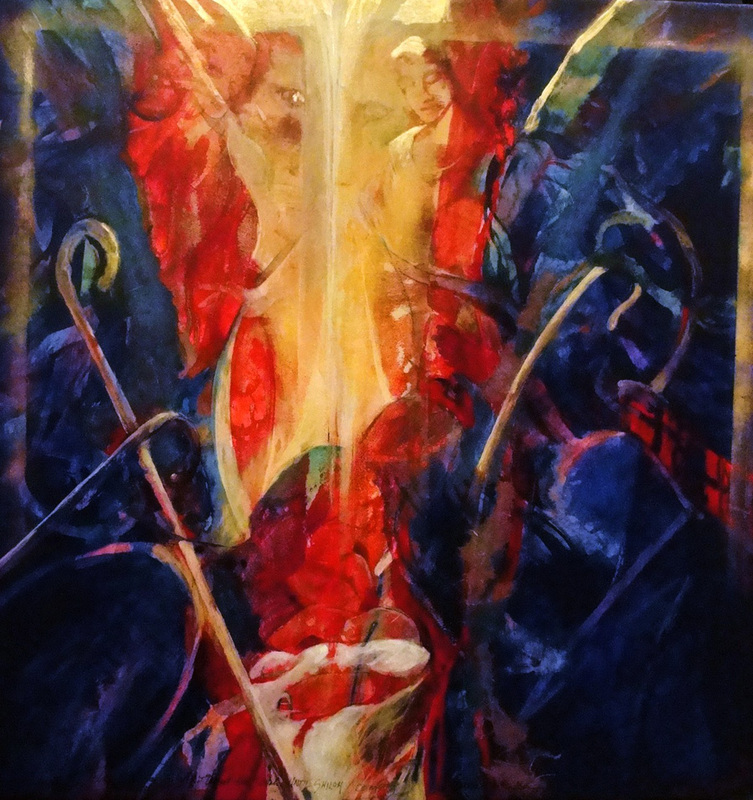 My painting Variations on a Theme / The Four Evangelists (12 x 12) seems a fitting image to reference the four gospel accounts of the birth and life and death of Christ Jesus – Emmanuel – God With Us. Matthew, Mark, Luke and John each present a uniquely inspired picture of Jesus’ birth and life. Take time to read them. 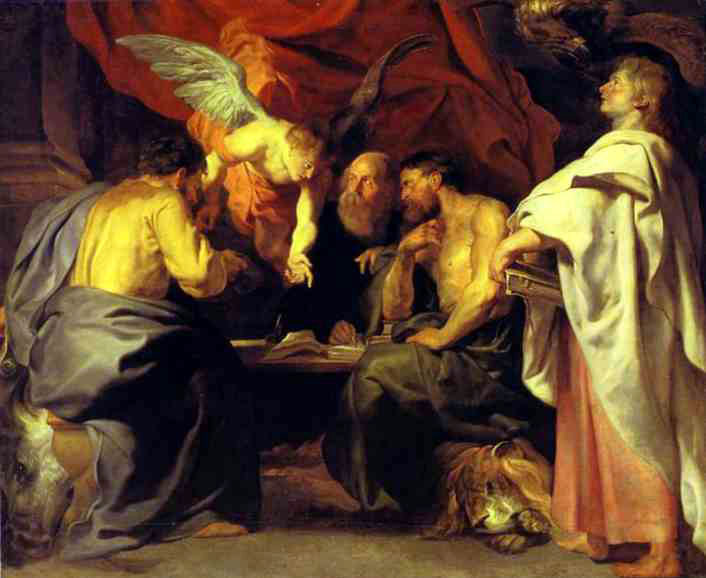 In 1614, the painter, Peter Paul Rubens painted The Four Evangelists. It was common in Medieval art to describe the gospel writers using animal characteristics – in reference to Revelation’s vision of God himself in His various attributes by four living creatures. We see a lion lying at Matthew’s feet, Mark rests on the ox, an eagle hovers over John, and a human face like an angel hovers over Luke. The four figures in Ezekiel’s vision also reference the four living creatures in Revelation. They surround the throne of God and proclaim His glory. Ezekiel 1:5-14 . . . Within it there were figures resembling four living beings. And this was their appearance: they had human form. Each of them had four faces and four wings. . . as for the form of their faces, each had the face of a man; all four had the face of a lion on the right, and a face of a bull on the left, and all four had the face of an eagle. 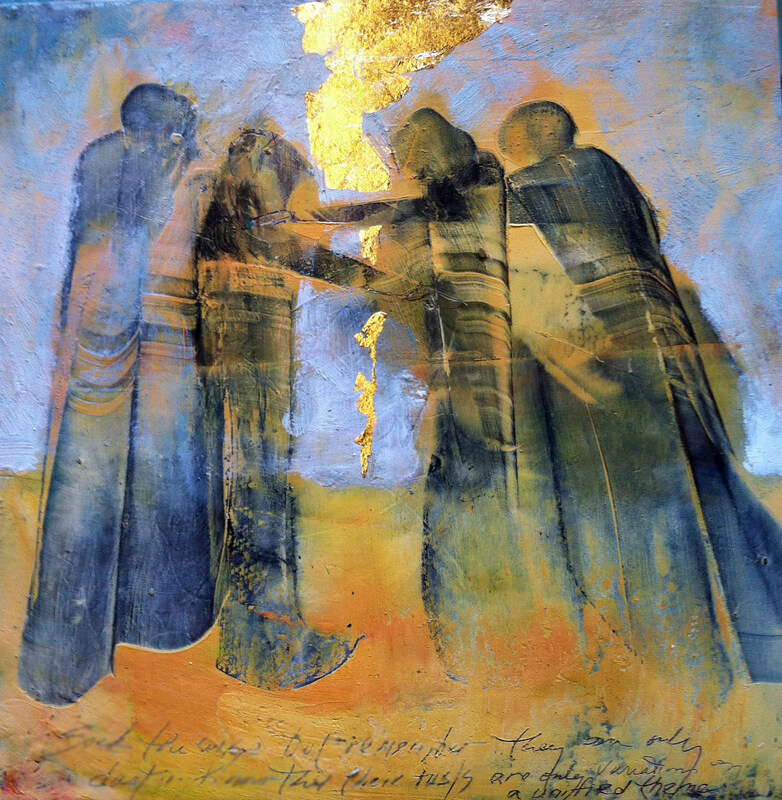 Ezekiel’s Vision shows my painting of the four creatures proclaiming glory to God . The mosaic below is over a thousand years old. 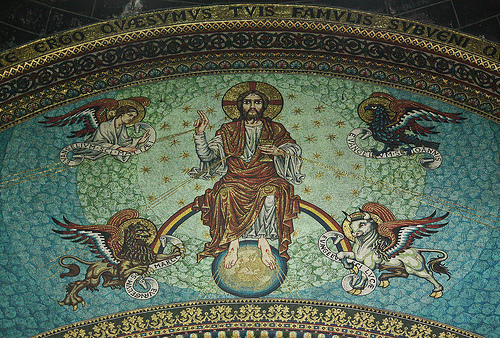 It shows Christ with the four creatures around him. The gospel or good news of Jesus Christ told by four inspired writers is central to salvation. 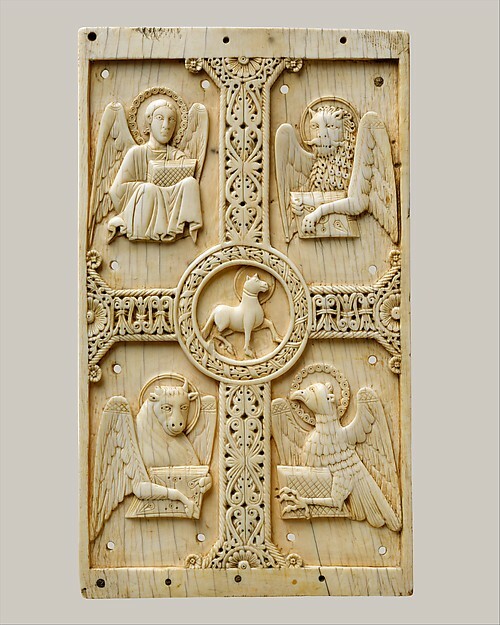 To the right is a Medieval ivory plaque which shows winged evangelists or tellers of good news surrounding The Lamb of God. Albrecht Durer painted The Four Apostles rather than The Four Evangelists(1526). He painted them for the town hall (not a church) of his hometown of Nuremberg. And instead of three panels, he omitted the prescribed center panel with Christ or Mary. The two panels are larger-than-life-sized portraits of the apostles. He painted John in red in the foreground pointing to the verse in his gospel which reads, “In the beginning was the Word . . . . ” The spread of The Word was important to Durer. He was a contemporary of Guttenberg who had just invented the printing press. Durer illustrated many copies of newly printed Bibles which were finally available to the common man. May we continue to celebrate the eternal story told in four uniquely and perfectly told narratives by Matthew, Mark, Luke, and John. This entry was posted in Shows and Galleries and tagged Advent Week three, Albrecht Durer, and the face of an eagle, Christ's birth, Christmas, Christmas Celebration, Ezekial's prophesy, in the beginning was the Word, Jesus' birth, Luke and John, Mark, Matthew, oil and cold wax, Revelation prophesy of four creatures, Rubens, Soli Deo Gloria, the Annunciation, the evangelists, the face of a lion, the face of a man, the face of an ox, the four apostles, the four evangelists, the four gospels, the four living creatures before the throne of God, the good news of salvation, the gospels, the Scepter Shall Not Depart from Judah, Until Shiloh Comes. Bookmark the permalink.